Palms Casino Resort recently opened an exciting collection of new restaurants, entertainment venues, a renovation of the resort’s casino and unveiled a property-wide contemporary art program that are all part of the $620 million top-to-bottom reimagination of the entire iconic property. The recent opening of this exciting array of new amenities signaled the completion of the first phase of upgrades, all of which are designed to transform the Palms into Las Vegas’ most elevated destination. Upon arrival, guests are greeted by lush new landscaping, including signature Palm trees, alongside a new 126-foot-tall brilliant LED screen marquee. The all-new luxurious VIP check-in lounge welcomes guests into an opulent retreat with dark brown woods, vanilla onyx and tufted leather seating while surrounded by a collection of fine art. The exciting transformation continues with a number of premier culinary experiences that includes Scotch 80 Prime, combining classic contemporary dining with expertly sourced spirits from the restaurant’s world-class scotch collection. Boasting one of the largest retail collections in the country, that includes the famed Macallan Fine & Rare Vintage collection, its total rare and vintage scotch whisky offerings are valued at $3 million. Palms will also soon be home to world-class restaurants from award-winning celebrity chefs Michael Symon and Marc Vetri, whose restaurants will debut in the Fall of this year, and Bobby Flay, whose restaurant will debut in Spring 2019. 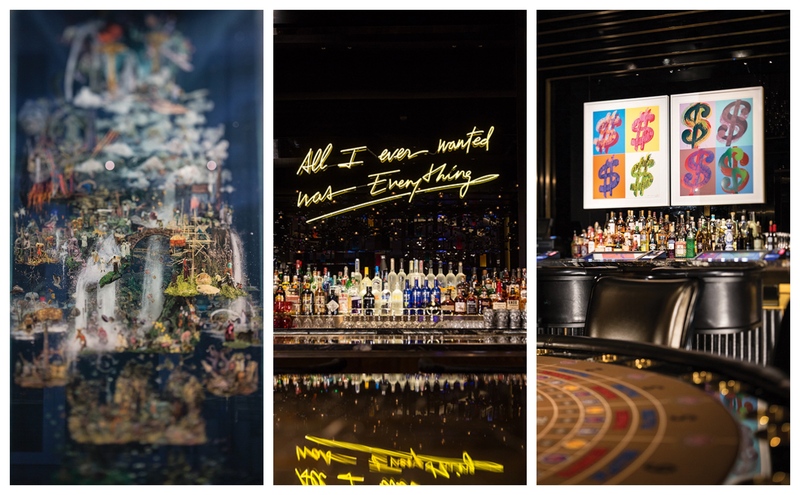 In addition, TAO Group, one of the most successful nightlife and restaurant companies in the world will be bringing their highly-acclaimed “Vandal” restaurant from New York City to the Palms in spring 2019. With the all-encompassing $620 million renovation, the Palms unveiled a property-wide contemporary art program that includes pieces and works from many globally renowned artists. Left: Apex Social Club; Center: Camden Cocktail Lounge; Right: High-limit gaming area. In addition to a one-of-a-kind art program woven all throughout the property – that includes pieces from the personal art collections of owners Frank and Lorenzo Fertitta and works by many globally renowned artists – the Palms now features one of the most advanced and inviting casino gaming floors in Las Vegas. Over 40 new table games, many of which now feature charging outlets, join more than 1,100 video poker and slot machines with the latest games and popular themes centered around a dramatic new center bar. World-class entertainment is a staple at the Palms, starting with the Pearl premier concert theater and the 14-screen Brenden Movieplex IMAX experience, with tiered stadium seating, luxury reclining leather seats, digital sound and giant wall-to-wall curved screens. 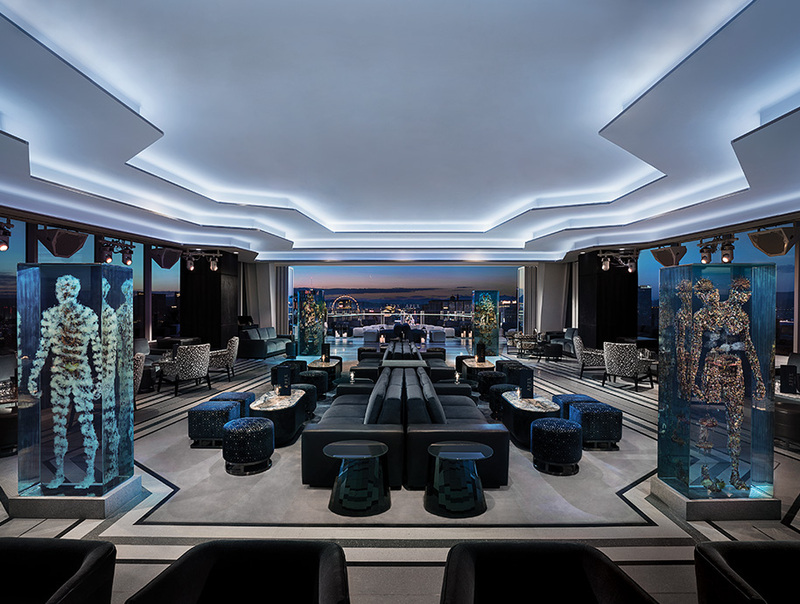 The rooftop Apex Social Club (located in the space formerly known as Ghostbar) offers a panoramic 180-degree-view of Las Vegas and an 8,000-square foot open-air boutique nightclub. The Camden Cocktail Lounge, located adjacent to the resort’s main entrance, is a dynamic lounge focusing on creative cocktails presented with a distinctive flair. These exciting new venues will soon be joined by a spectacular 29,000-square foot nightclub and world-class 73,000-square foot pool club, both developed in partnership with TAO Group, which will redefine the nightclub and dayclub experience in Las Vegas. The nightclub and dayclub venues are scheduled to open in Spring 2019. The expansive 5,000 sq.ft. single-story Sky Villa, Villa 31 features an 11-seat curved bar overlooking pool and two luxurious living and media areas. Finally, and most recently, in addition to the newly remodeled Fantasy Tower guest rooms and suites, Palms has unveiled a spectacular redesign of its iconic Sky Villas as part of the hotel’s massive $620 million property-wide renovation. 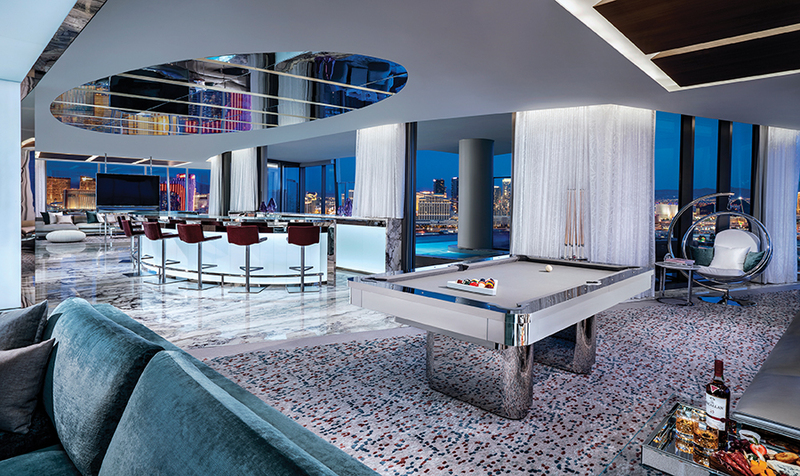 The Palms’ six ultra-luxury Sky Villas feature cantilever infinity pools and unrivaled views of the Las Vegas strip and are some of the most elegant hotel accommodations in the world. Ranging from $25,000 to $40,000 a night, guests of Palms’ Sky Villas bask in opulence and indulge in exclusive world-class style. Each of the 5,000 to 9,000 square foot multi-bedroom villas include an array of luxury amenities ranging from redwood cedar saunas and private fitness rooms (with Peleton bikes and Woodway treadmills) to expansive entertaining, dining and media/theater areas and the famous glass cantilever pools that jut out over the private balconies offering unobstructed views of the Strip and Las Vegas skyline. The Sky Villas also feature works of art by known artists including Dabs & Myla and REVOK as part of the property’s new Art Program. Today’s Palms rivals the best Las Vegas has to offer. For more information visit www.palms.com. Photos courtesy of Palms Casino Resort. 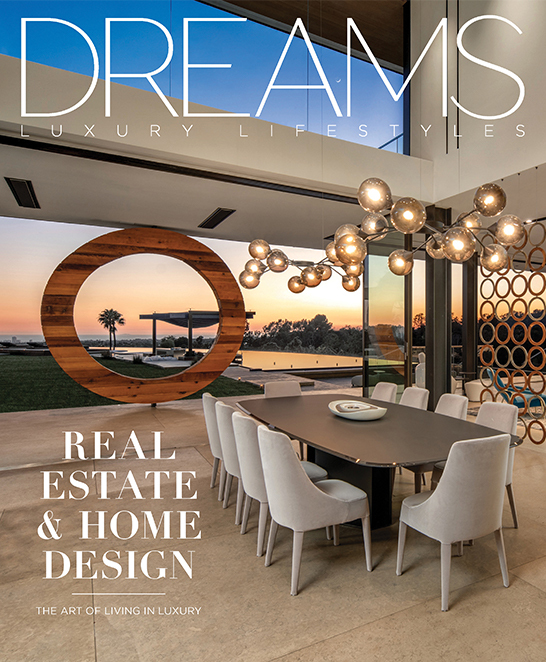 Dreams Magazine is read by the affluent in Los Angeles and Las Vegas. Quarterly print magazines enhanced with digital media creates impact. 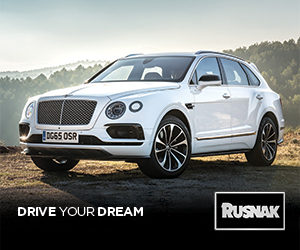 Our visual storytelling and exclusive content sets us apart. © 2019 Copyright Dreams Magazine | T3, Inc. | All Rights Reserved.